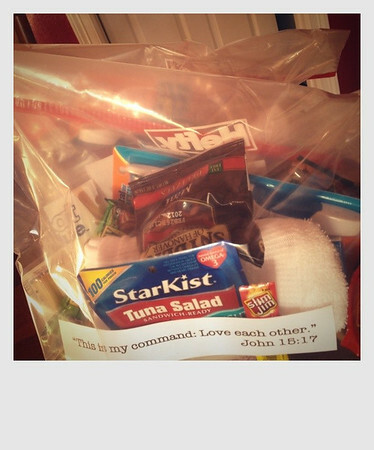 One of the ideas for The Happy Day Project was to prepare blessing bags to have on hand when you see someone in need (maybe someone at the intersection holding a sign or at a rest area* or in area where there are more visible homeless). 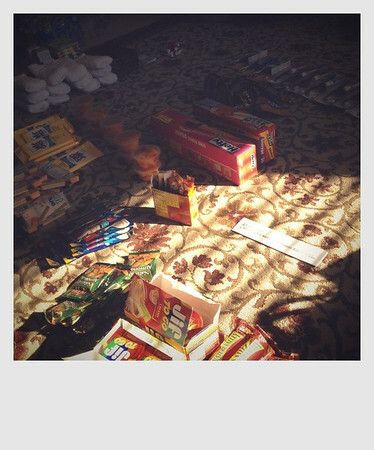 Last November I read about Leslie and her family preparing blessing bags and knew that was something I should and could do. We also included a verse and a card from our church. (I tried to print out the cute printable Julie made but our ink cartridge ran out of yellow, boo. Next time.) We might have been able to stuff everything into a gallon size baggie, but we used the 2.5 gallon size just to be safe (though they are giganto). We set everything out all fancy like onto the floor (ha!) 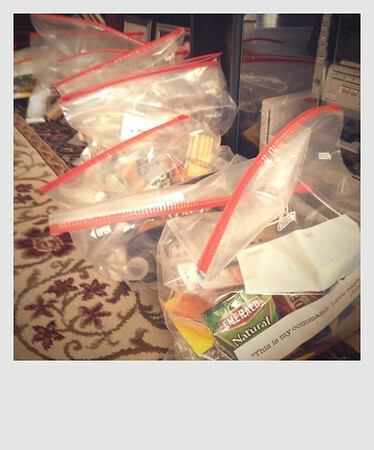 and then passed the bags around to fill them. Easy breezy, Cover Girl! Don't they look so happy sitting there all in a happy row ready to hopefully make someone happy?!? Now we have two bags of happiness in our car** just waiting to bless someone--hopefully soon! The thing is though, we don't see a lot of homeless people in our area. If they are around it's not very obvious (like when you are in certain areas of downtown Houston). So I'm praying for my eyes to be opened and really see others that might be in need but not necessarily look like I think a homeless person might look. I'm sure there are more than I realize in that situation. My girlfriends and I plan to do this regularly now, like maybe every other month or something, so we'll always be prepared to bless someone. That feels great! They didn't cost too much or take too long to make, what with everyone sharing the task and all. That feels great too! Maybe you and your family and friends can make some too. C'mon, I double dog dare you. xo. *I'll never forget the time in high school, while on a family road trip to Florida, stopping at a rest area and seeing a family with car trouble that had posted signs in the rest rooms and wanting to help. Of course my dad was convinced it was a scam (sadly, that happens) and refused to give money, so we gave them our sandwich fixings. The mom looked grateful, but the dad looked disappointed and my dad still teases about the family that *stole* his baloney. my kids and I used to carry these around before they made it illegal to stand on the corner asking for help. I still see folks from time to time around here. and of course if you go to houston you will see some too. I remember having to pull over one day and my son walking back to find the guy to give the bag to. it is a good way to bless others without feeling like you've been scammed. the kids love it! I like the zipper bags. I'm in charge of the food pantry in my area and those bags are really a blessing. Hygiene products are very expensive and those really help!